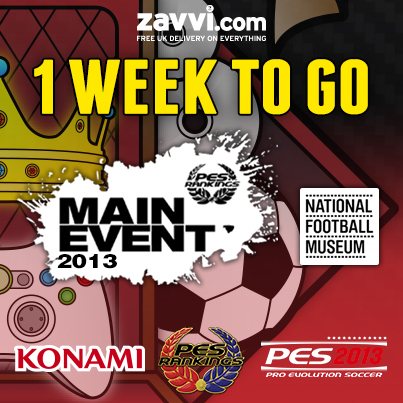 Next weekend see's the return of the UK's most prestigious Pro Evolution Soccer tournament. Hosted at the National Football Museum in Manchester, this year's competition will see 32 of the region's best PES 2013 players - determined by the UK's official Pro Evolution Soccer league - battle it out for everlasting glory in the UK's biggest PES tournament of the year. With £3000 worth of prizes up for grabs, players must not forget their shooting boots if they are to become the UK's number one player for PES 2013. And if that wasn't exciting enough for you, the ultimate champion will also receive the honour of representing the UK at this year's PES World Finals next month in Dubai. The qualifying rounds have already closed, however, if you're still interested in attending the event, you'll be pleased to know there will be free entry for all spectators, and a few special extras thrown in too. The museum's Football Plus+ exhibits, including the Match Of The Day commentary challenge, will also be available on the day. Speaking of which, if you think you're useful from 12 yards, make sure you enter the Penalty Shootout exhibit where you could win a very special piece of football memorabilia. Score the best penalty and you'll bag yourself a replica 1966 England shirt, hand-signed by Sir Geoff Hurst and Martin Peters - both of England's goalscorers in that famous final at Wembley Stadium! Take in the passion as you watch the Main Event unfold, have your photo taken with the historic FA Cup trophy, see Diego Maradona's 'hand of God' jersey, and experience much more. Trust us, if you're near Manchester next weekend, you'd be mad to miss it!